Many modern thinkers took up the liberal mandate of John Locke, pushing it to much greater levels of abstraction, but perhaps none more notable than the American thinker John Rawls. Rawls looked to refine the contractarian thinking of Locke, Rousseau, and Kant for the twentieth and twenty-first century. Like his predecessors, Rawls begins with an idol – an abstract rational man as free and equal with natural rights from which we can deduce a form of government. He offers no metaphysical validation for his claims about the human person; they are creedal, dogmatic statements of belief. For Rawls, man is a political animal, justice is ‘fairness’ and reasonable, rational citizens will support such a view of society that is based on the overlapping consensus of reasonable individuals, not theological foundations from revealed religion. This view inevitably leads to the situation inherent in modern liberal democracies today – that there can be no public privileging of any one religion. This enforces the interiorisation and relativisation of religious belief. Christianity can have a voice only insofar as it can make common cause with Islam, Buddhism, Hinduism or paganism. Like Locke, Rawls thus separates religious belief from the sphere of government but does so by arguing for a distinction between privately held religious ‘beliefs’ and common reason. Beliefs that are not obvious and evident to the common public reason of other citizens are ruled out of bounds for political life. But this just begs the question: what is reasonable, fair and just? Moreover, who has the right to decide what are private beliefs and what constitutes common reason? In reality, liberalism is a comprehensive doctrine which asserts itself over the Christian faith and tradition, despite beginning from a supposedly purely political conception. The common practice of referring to democratic society illustrates the problem today. Society itself (which is much more than the state) is manifestly not democratic. The family, church, local school and business are not democracies! Only if the state embodies a total order (i.e. the state absorbs all of life) can we speak of democratic society, rather than simply referring to a democratic state. 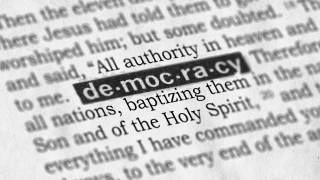 This pervasive democratic thinking brings with it the overwhelming temptation for believers to attempt a synthesis of liberal-democracy with Christianity. Just as the second-century Gnostic philosopher and heretic Carpocrates sought a synthesis between Greek thought and the Christ of Scripture, the modern Christian risks accommodating Christ the Lord to the pretensions of liberal-democratic reason. The Carpocratians had statues of Jesus, Pythagoras, Plato, and Aristotle together in their shrines. For them Jesus was a man of pure soul, a wonderful philosopher, and anyone had the potential to rise to His level or surpass Him. He was not the sovereign Creator, Redeemer and Lord, the ‘ruler of the kings of the earth’ (Rev. 1:5). This Greco-Roman Jesus had a shelf-life only as long as that synthesis culture lasted. Once that culture collapsed, the relevance of their imaginary Gnostic Jesus disappeared with it. If we re-shape Christ in terms of the democratic general will, reducing Him to the servant of man’s political reason or relegating Him to an artificial private sphere with every other religious teacher and philosopher, our relevance, and that of the truncated gospel we preach, will disappear with an apostate society, just like the heretics of the past. The gates of all life, including political life, must be lifted up to let Him in, or they shall be broken down! All spheres of human authority are derived from or conferred by, and are subject, at all times and places, to the sovereign and absolute authority of Christ the Lord, in terms of His Word. In substance and content, these secular dogmas are heretical in their assertion of popular sovereignty, their denial of God’s sovereignty, of human sin and fallenness, and the Lordship of Jesus Christ. The cry of eighteenth-century liberalism, ‘Vox populi, vox Dei’ (the voice of the people is the voice of God), echoing down to the present and informing the thinking of our era, is heresy, and is no less so because, as political doctrine, it is unlikely to get a Christian into trouble with their local presbytery, diocese or elders. The liberal account of sovereignty, uncritically adopted for the public space by so many Christians today, has a poor record of preserving freedom, justice and human dignity for persons made in God’s image. With all its emphasis on human autonomy, it seeks to recreate society in the image of a rebellious and sinful humanity. With Edmund Burke we must be quick to remind fellow believers, and our culture at large, that neither regent, nor commoner, is ultimate sovereign. To deny total sovereignty to Jesus Christ in every area of life, like all heresy, is an act of revolution against God. In an era of liberal-democratic heresy, we can take our stand with Carpocrates or Christ. Only one of these has a future. We have clearly seen that what we believe about God and the nature of human beings has massive implications in every sphere of life, not just the institutional church. Indeed, heretical thinking in the lives of Christians often only comes to expression in attitudes and decisions outside of the life of the institutional church. We cannot haul the ‘state’ before a church counsel for heresy, both because the state is a public juridical entity, not an individual person professing the faith, and heresy is an offense within the church, not the sphere of the state. However, all Christians, including Christians working in the sphere of the state are accountable to God and to his church for faithfulness to an orthodox Christian confession. That confession needs to be worked out consistently in every aspect of our lives and we need to help one another to see where we are living in contradiction to our own confession. This means it is possible, as I have argued, to hold political views that are grounded in an erroneous doctrine of God, authority and man, even when we are unaware of it. To persist in such views when we know better is heresy – and many Christians today are in the grip of it in the name of political neutrality. The myth of neutrality needs to be exposed and political heresy brought to light by the Word of God. We have also seen that the state as a democratic institution is more blessing than curse in modern history. We can and should be thankful to God for bringing to light the inner nature of the state as a public and distinct area of life to the feudal family and the church, with its own particular nature, structure and purpose as God’s servant. Governmental institutions that are accountable to the people and where people from all areas and walks of life can stand for election to parliament or congress to represent their constituency has played an important role in limiting a lawless use or abuse of power in a fallen world. However, any constitution that claims that ‘the people’ have ultimate sovereignty (rather than seeing government as a delegated sovereignty under God) is, by definition, a tyranny. Where truth is immanentised (rather than being found in the transcendent God) and the ‘divine’ (vox dei) is located in creation, then law, power, authority and justice are made the creations of ‘the people’ and oppression and persecution are only around the historical corner, especially for Christians. This is an era of cultural conflict because we are in the grip of a struggle for sovereignty. Does it belong to God or to man? 1. Jonah Goldberg, Liberal Fascism: The Secret History of the American Left, from Mussolini to the Politics of Change (New York: Broadway Books, 2007), 326-327. 2. Marcello Pera, Why We Should Call Ourselves Christians(New York: Encounter Books, 2008), 33. 3. Ryszard Legutko, The Demon in Democracy: Totalitarian Temptations in Free Societies(New York: Encounter Books, 2016), 65. 4. R.J. Rushdoony, Christianity and the State(Vallecito, CA: Ross House Books, 1986), 73-74. 5. Herman Dooyeweerd, The Struggle for A Christian Politics: Collected Works, Series B – Volume 17(New York: Paideia Press, 2008), 71. 6. Abraham Kuyper, Pro Rege: Living Under Christ’s Kingship: Collected Works in Public Theology, Vol 1(Bellingham WA: Lexham Press, 2016), 72. 7. Guillaume Groen Van Prinsterer, Christian Political Action in an Age of Revolution (Aalten, The Netherlands: WordBridge, 2015), 8, 88-89.